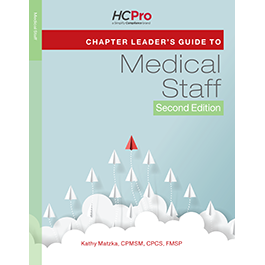 The Chapter Leader's Guide to Medical Staff, 2nd edition breaks down The Joint Commission’s medical staff requirements into easy-to-understand solutions to meet the challenges of these complex standards. You get simplified explanations of the chapter’s key components along with communication techniques to help foster a strong and successful partnership between survey coordinator and chapter leader. Kathy Matzka, CPMSM, CPCS, FMSP, is a speaker, consultant, and author with more than 30 years of experience in credentialing, privileging, and medical staff services. Matzka worked for 13 years as a hospital medical staff coordinator before venturing out on her own as an independent consultant, writer, and speaker. She is also one of the first recipients of the National Association Medical Staff Services (NAMSS) Fellow Designation, which is the pinnacle of achievement and acknowledgment for the medical services professional (MSP). It recognizes a career MSP who has made outstanding contributions to the profession through service as a leader, mentor, and educator. Faculty Disclosure Statement: HCPro has confirmed that none of the faculty/presenters or contributors have any relevant financial relationships to disclose related to the content of this educational activity.